You can rent a wetsuit for 5 euros half day (4 hours) or any surf material for more than one week. As times have changed, we all know that traveling with your surfboard, wetsuit, bodyboard, etc is uncomfortable. Nowadays, the best option is to rent your surf material, wetsuit, board or SUP board, and doing so with us will be most profitable as we have really competitive prices. More so, you will avoid unpleasant surprises regarding the handling of your gear throughout your journey. You can rent your board in Tenerife throughout any of our K16 shops as here you can find all your needed material. We have an extensive experience in the surfing line of business, being a constant presence on the market for more than 15 years. Our expertise and professionalism vouch for us. We have a broad range of surf, bodyboard, SUP and skate material so you won’t have any problems finding exactly what you need, in complete safety and confidence. We have at your disposal a wide range of boards, for all tastes and levels. Check out our offers and rent the right board you need for a successful surfing vacation. Contact us before your trip and tell us what you need, and we will offer you the best choice among the most prestigious brands and models on the market. We rent from half day (4 hours). If you rent a full week, we will lend you the surfboard car rack free of charge. And, if you want to buy it afterwards, we will discount the rental amount from the total price and will help you pack it so you can take home the new toy you always dreamed of… Surf is Life! You can rent a bodyboard for 9 euros half day (4 hours) or any surf material for more than one week. As times have changed, we all know that traveling with your bodyboard, surfboard, longboard, surf skate is uncomfortable. Nowadays, the best option is to rent your surf material hard board, soft board, body board or SUP board, and doing so with us will be most profitable as we have really competitive prices. More so, you will avoid unpleasant surprises regarding the handling of your gear throughout your journey. 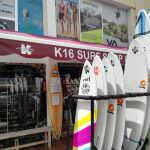 You can rent your board in Tenerife throughout any of our K16 shops as here you can find all your needed material. We have an extensive experience in the surfing line of business, being a constant presence on the market for more than 15 years. Our expertise and professionalism vouch for us. We have a broad range of surf, bodyboard, SUP and skate material so you won’t have any problems finding exactly what you need, in complete safety and confidence. We have at your disposal a wide range of boards, for all tastes and levels. Check out our offers and rent the right board you need for a successful surfing vacation. Contact us before your trip and tell us what you need, and we will offer you the best choice among the most prestigious brands and models on the market. We rent from half day (4 hours). If you rent a full week, we will lend you the surfboard car rack free of charge. And, if you want to buy it afterwards, we will discount the rental amount from the total price and will help you pack it so you can take home the new toy you always dreamed of… Surf is Life! You can rent a CARVER surf skate for 10 euros half day (4 hours) or any surf material for more than one week. As times have changed, we all know that traveling with your skate material is uncomfortable. Nowadays, the best option is to rent your skateboard, and doing so with us will be most profitable as we have really competitive prices. More so, you will avoid unpleasant surprises regarding the handling of your gear throughout your journey. 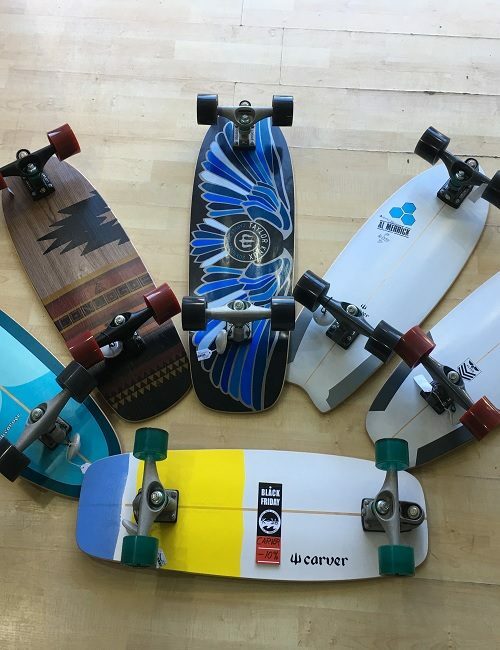 You can rent your skateboard in Tenerife throughout any of our K16 shops as here you can find all your needed material. We have an extensive experience in the surfing line of business, being a constant presence on the market for more than 15 years. Our expertise and professionalism vouch for us. We have a broad range of surf, bodyboard, SUP and skate material so you won’t have any problems finding exactly what you need, in complete safety and confidence. We have at your disposal a wide range of boards, for all tastes and levels. Check out our offers and rent the right board you need for a successful surfing vacation. Contact us before your trip and tell us what you need, and we will offer you the best choice among the most prestigious brands and models on the market. We rent from half day (4 hours). If you rent a full week, we will lend you the surfboard car rack free of charge. And, if you want to buy it afterwards, we will discount the rental amount from the total price and will help you pack it so you can take home the new toy you always dreamed of… Surf is Life! You can rent a soft surfboard for 10 euros per half day (4 hours) or any surf material for more than one week. As times have changed, we all know that traveling with your surfboard is uncomfortable. 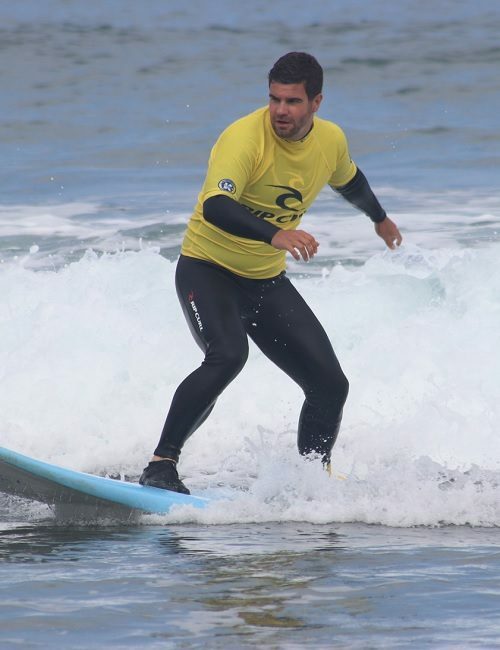 Nowadays, the best option is to rent your surf board, body board or SUP board, and doing so with us will be most profitable as we have really competitive prices. More so, you will avoid unpleasant surprises regarding the handling of your gear throughout your journey. You can rent your board in Tenerife throughout any of our K16 shops as here you can find all your needed material. We have an extensive experience in the surfing line of business, being a constant presence on the market for more than 15 years. Our expertise and professionalism vouch for us. 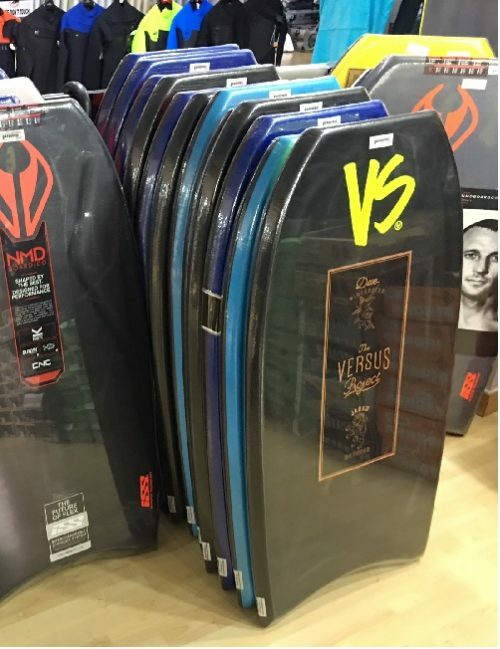 We have a broad range of surf, bodyboard, SUP and skate material so you won’t have any problems finding exactly what you need, in complete safety and confidence. We have at your disposal a wide range of boards, for all tastes and levels. Check out our offers and rent the right board you need for a successful surfing vacation. Contact us before your trip and tell us what you need, and we will offer you the best choice among the most prestigious brands and models on the market. We rent from half day (4 hours). If you rent a full week, we will lend you the surfboard car rack free of charge. And, if you want to buy it afterwards, we will discount the rental amount from the total price and will help you pack it so you can take home the new toy you always dreamed of… Surf is Life!